Exceptional luggage for an exceptional automobile. 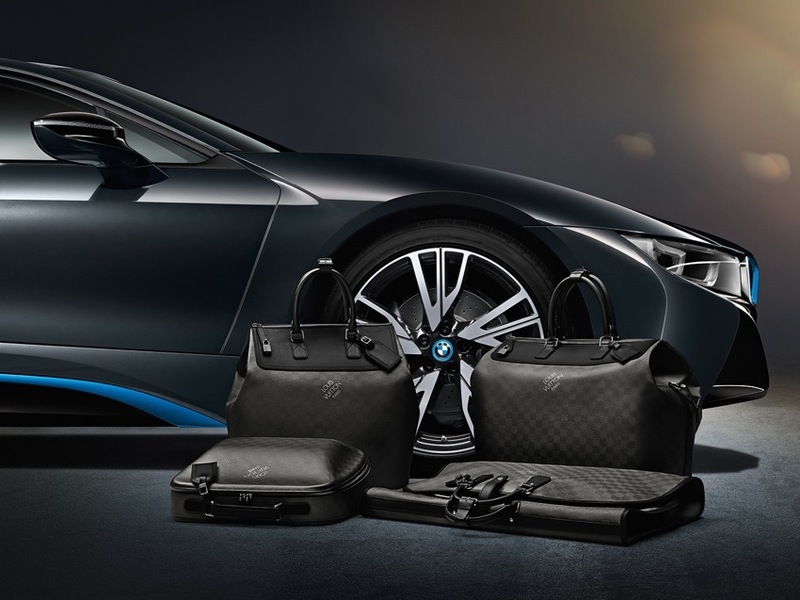 Louis Vuitton, the pioneer of the art of travel, has created a tailor-made set of luggage for the most progressive sports car – the BMW i8 plug-in hybrid. The innovative collection of luggage comprises two travel bags, a business case and a garment bag. 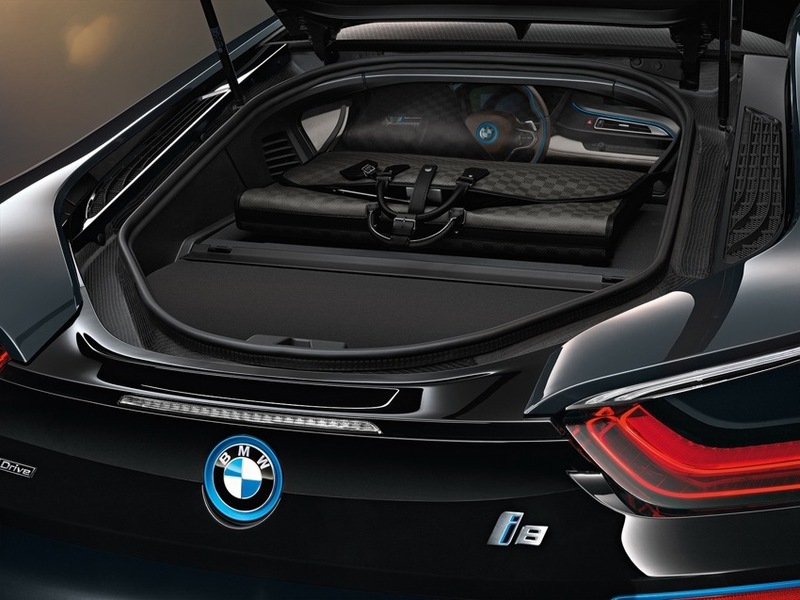 To ensure optimal use of space, the luggage items have been tailor-made to fit perfectly into the interior of the revolutionary BMW i8. Distinguished and elegant – the design. BMW i8. Its sophisticated look comes courtesy of the unmistakable chequered Damier pattern – a Louis Vuitton hallmark – and a laser-etched Louis Vuitton signature. 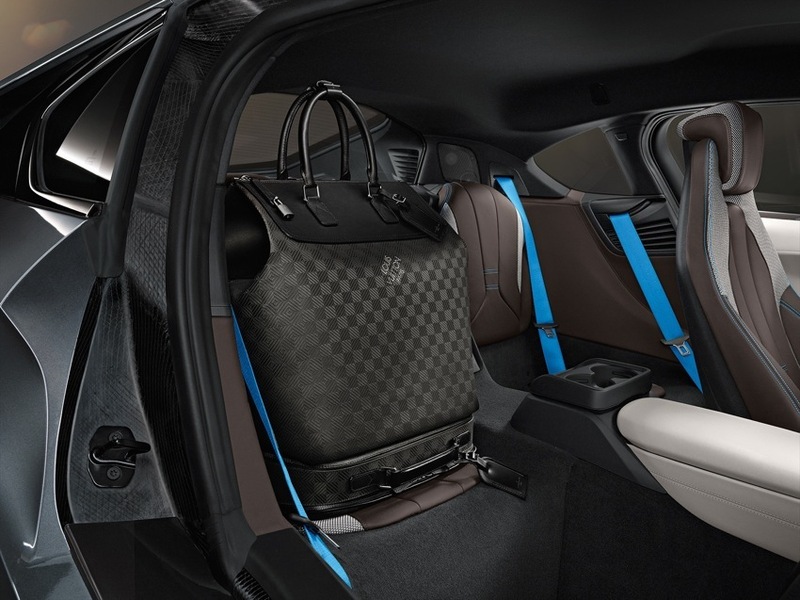 Black and electric blue used in the microfibre lining take their cue from the trademark brand colours of the BMW i8 and bag handles are made from dyed natural leather, a sign of Louis Vuitton quality. All items in the collection come with leather name tags and the iconic Louis Vuitton padlock with the exception of the garment bag. A strong future – the material. 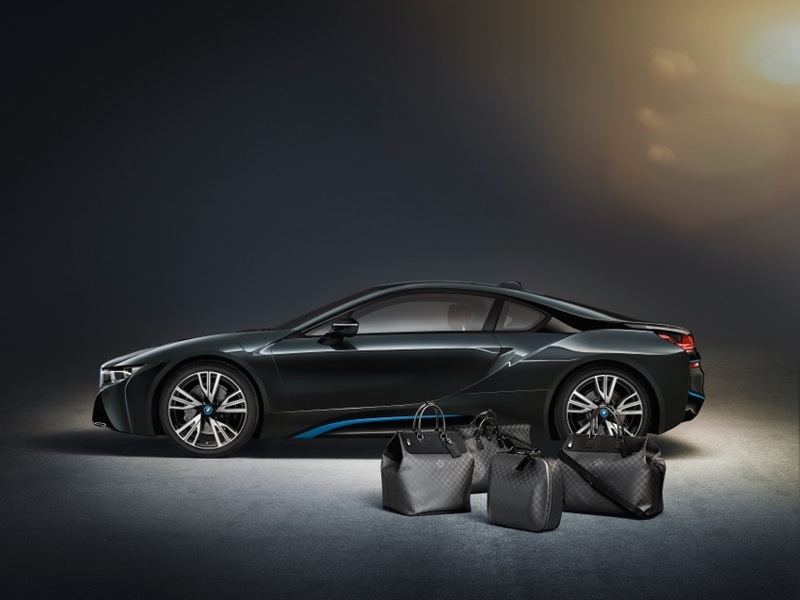 Inspired by the visionary design of the BMW i8, the bags and cases – like the sports car’s innovative passenger cell – are made entirely from carbon fibre. This particularly lightweight yet extremely sturdy high-tech material has been used by Louis Vuitton to create a special textile. It provides great robustness and strength, and as such is made for the rigours of travel – no matter how long and arduous the drive. 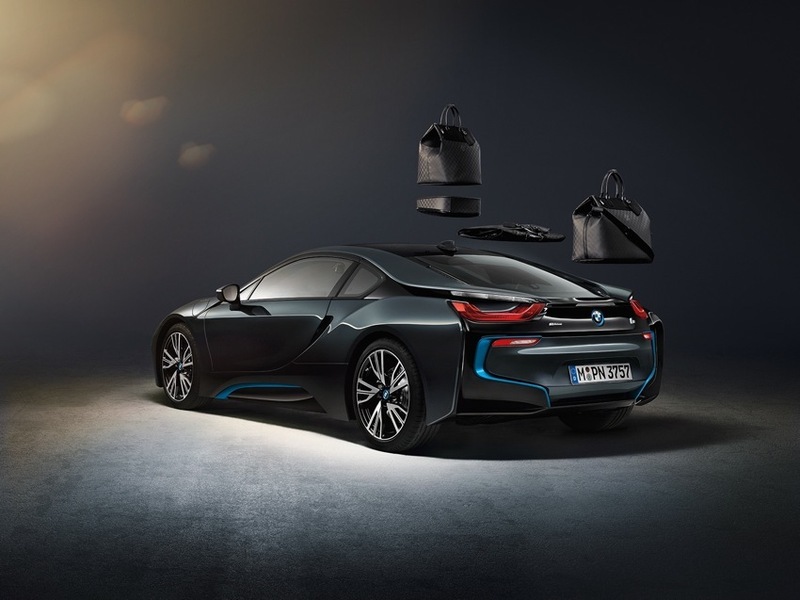 Tailored to the BMW i8 – the luggage. BMW i8. The sturdy hardshell Business Case i8 which is also ideal for carrying laptops, matches the shape of the rear seats; while the smallWeekender PM i8 is designed to rest on its surface. The Louis Vuitton luggage series will be available upon request in a selection of Louis Vuitton stores worldwide (Munich, Milan, London, Paris, Moscow, Dubai, New York, Los Angeles) starting April 1st 2014. Revolution in sports cars – the BMW i8. The BMW i8 is the most progressive sports car and is the BMW Group’s first plug-in hybrid vehicle and the second model from the BMW i brand. It is a 2+2-seater boasting visionary design and intelligent lightweight engineering. As a plug-in hybrid, the BMW i8 unites the advantages of innovative electric drive and the latest combustion-engine technology. The upshot is an extraordinary driving experience that delivers the dynamics of a sports car (0 – 100 km/h / 62 mph in 4.4 seconds) along with fuel economy and emissions figures of a small city car (2.1 l /100km / 49 g CO2/km). This means not just purely electric emission-free driving around town but also sporty performance on inter-urban routes. The athletic personality of this revolutionary sports car is patently manifest in its design: classical sports car proportions, spectacular scissor doors, clean, minimalist lines and a low-slung silhouette all imbue it with its powerful, dynamic shape. The sporty character of the BMW i8 exterior makes a seamless transition into the interior’s future-focused design.